I’m fairly convinced, though don’t have any stats, that there’s been a fairly large increase over the last few years in the number of concerts, talks and events for people who like hearing film music performed live and hearing from the composers who wrote it. Living in London I’m spoiled for choice with the wonderful BAFTA Conversations with Screen Composers – a series of interviews with composers at the Royal Albert Hall. The RAH has also been increasing its programming of concerts celebrating the work of a particular film composer, including screenings of films with a live orchestra performing the music. One of the best resource for film music concerts and related events around the world is the Movies in Concert website especially as anyone can submit details of a concert that’s been published on an events page. I would like to encourage composers, conductors, musicians, event organisers, orchestra folk, venue staff, film music fans and anyone else to see if concerts they know of are already listed and, if not, to add them using the Submit a Concert form – and to make a note of the page for future concerts, thanks! The site now also has a dedicated Twitter feed – @moviesinconcert – and whenever new information is added to the website, or information already there is updated, an update-tweet will be emitted automatically by the account. I created this Twitter account after spotting that they had an RSS feed, and it’s since been adopted by the site (woohoo) but I’m not affiliated with Movies in Concert. 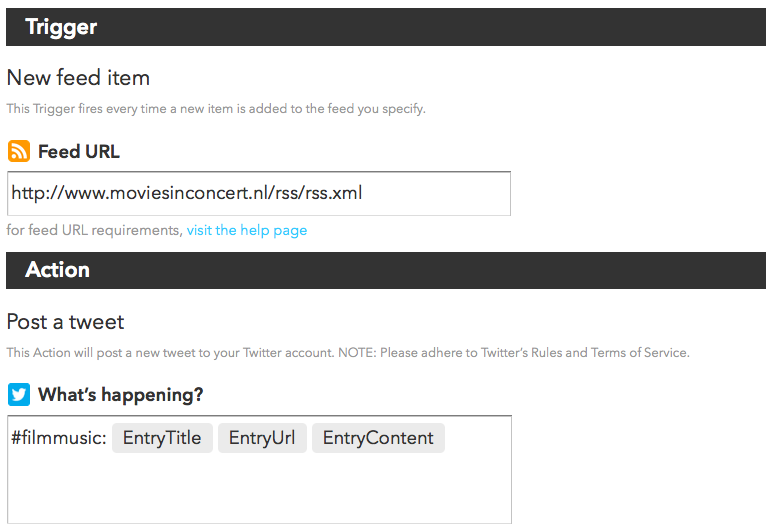 If you’re interested in the technology behind the @moviesinconcert Twitter account (it’s not very complicated) read on, in case you want to set up something similar. Movies in Concert, like many sites, has an RSS feed already set up for its updates – you can use an RSS reader to follow these (a bit similar to signing up for email updates). It’s also quite straightforward to set things up so that each new update is turned into a tweet that anyone on Twitter can follow. There’s a great little website called IF This Then That (IFTTT) which will do it for you. 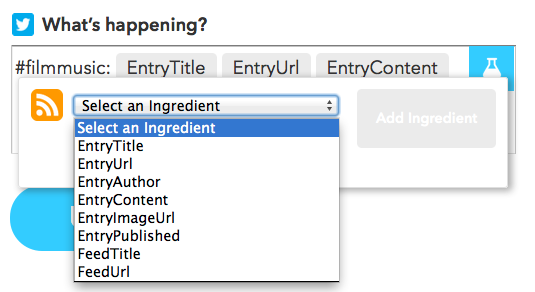 To make your own Twitter feed based on an RSS feed you can use an IFTTT recipe that converts RSS feed items into tweets, it’s called RSS to Twitter. This is the specific recipe I used, adapted from the RSS to Twitter specifically for @moviesinconcert, you’re welcome to use it but note that there’s no particular benefit in recreating the same feed as it already exists! Here’s what it looks like under the bonnet with the RSS feed as the ‘trigger’ causing the action of sending out a tweet. I’ve added the hashtag #filmmusic and asked the recipe to publish this along with the title of the update from Movies in Concert along with the address (Entry URL) and the first line of the page. If you click into the lower box it looks like this and you can click on the blue ‘science flask’ icon to change the options, this will change what the tweets look like.